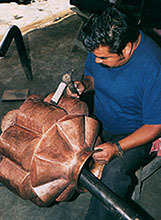 Hand-crafted copper ware Michoacan's markets are some of Mexico's most colorful. Shopping throughout the state is exciting. Look especially for pottery, wood carvings, musical instruments (guitars), copper ware, and candy. Several villages specialize in a particular folk art tradition. Visit Quiroga for lacquered wood, Patzcuaro for it's native markets, Paracho for guitars, and Santa Clara del Cobre for copper products. Mercado de Dulces, near Palacio Clavijero, is the candy and sweets shop. You will find every goodies imaginable. The best time to be there is before and during the Day of the Dead festivities.